Nicole Miller Luggage has become a world recognized brand which is synonymous with ‘style’, ‘fashion’, and ‘modern luggage advancements’. 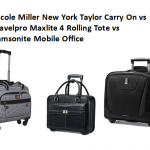 With such a competitor, it’s hard for other brands to keep up, but when it comes to under seat options many brands like the adventure brand Samsonite – known for its durability and smart designs – as well as the lesser known BEBE feminine luggage – known for its high fashion sense – all offer competing carry-on items which stay neck in neck with Nicole Miller on a race to the finish line. So, who’s best? In comparing these brands we’ve taken a look at their under-seat luggage choices and have chosen the cream of the crop. Nicole Millers Signature Quilt Under-Seat Bag faces off against BEBE’s rather new and unique Women’s Valentina Under-Seat Bag, with Samsonite’s Large Wheeled Under-Seat suitcase matching both of these designer options with its improved storage space that’s smart and great for affordable travel on short business trips. In offering nothing but the best, we take three superior under seat bags at the top of the luggage market and compare them side by side by side for your convenience as well as for the best view on which brand takes home ‘best in show’. Each review of an under-seat bag from our three brands breaks the product down into four separate categories that list nothing but the facts: suitcase storage, materials/durability, additional features, and size/style options. 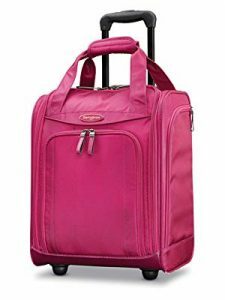 It’s our belief that given this information readers should easily be able to pick out the best suitcase for their needs, as well as generally see which brand offers the finest carry-on for short travel, or as a companion to a checked bag that you already own. 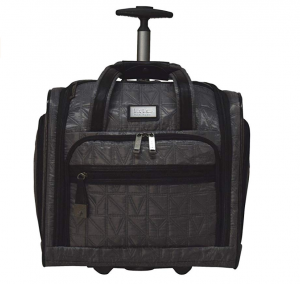 Nicole Miller luggage has a wide variety of carry-on’s available on the market, but for under seat needs that offer quick access and hassle-free placement in a crowded airplane, this Signature Quilt Carry-On features one of the fashion brands best designs. 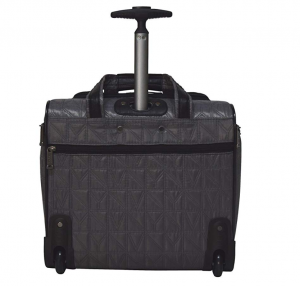 The quilted exterior provides added durability, the telescopic handle is ergonomic and doesn’t create extra non-fitting bulkiness, while the wheels can negotiate any terrain be it carpets or urban streets. 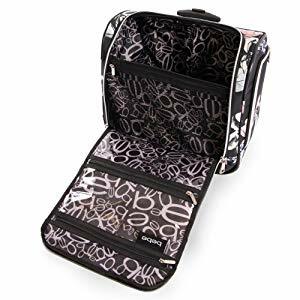 Under-seat storage bags are typical somewhat space-limiting and not to be compared to your average carry-on that fits in the overhead bin. For its space maximizing design, however, this Nicole Miller luggage offers a brilliant design with added storage space in the form of left and right-side zippered pockets, two front opening pockets, and an oval shape for a roof opening into a stacking main compartment. Easily fit between 2 to 3 outfits (depending on the weather you’re packing for) stacked in this central compartment. This Miller original is made from cotton canvas materials with a quilted exterior for even more durability. 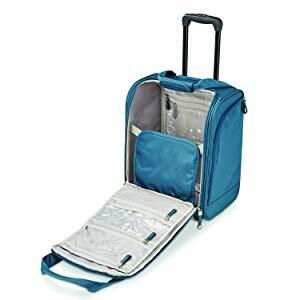 As far as lightweight luggage goes, nylon materials are typically the strongest and most abrasion resistant, but with the added quilting and cotton canvas design this under-seat suitcase is highly durable and neck in neck with more expensive nylon brands. As always, suitcases which use polyester are near the lower end of the durability scale. 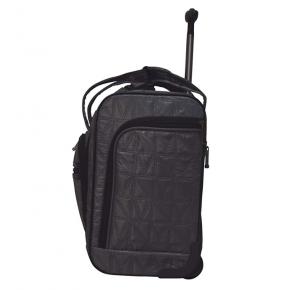 Additional must-have features include the single pole simple telescopic handle, in-line skate wheels which are better for travel on all surfaces (due to their design) than any spinner wheels, along with the padded exterior which creates added protection for electronics such as tablets and computers. The final measurements for this under-seat Nicole Miller are 15.8 x 15.7 x 9.2 inches, with an unpacked weight on 6.5 pounds that can easily skirt under the typical imposed weight limit of 30-35 pounds for a carry-on. Style options are probably the weak link in the overall scheme of what this suitcase has to offer, and although Nicole Miller typically offers plenty of unique style choices, this carry-on only comes in the standard grey styling. The look overall is very fashionable for the business-going woman. At 16.5 inches this underseat offers a little more storage space but not as much foot room when tucked under your chair – as usual, there are drawbacks between getting one suitcase over another. 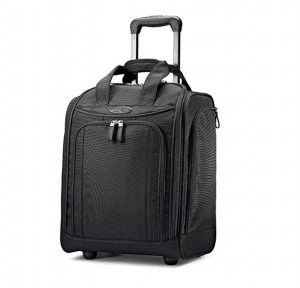 However, if storage is what you need for your two-day getaway, this is an excellent pick! The main storage space offers stacking capacity for 2-3 outfits and includes a zippered interior divider that’s great for toiletries. The opening roof-lid also offers two zippered interior pockets. 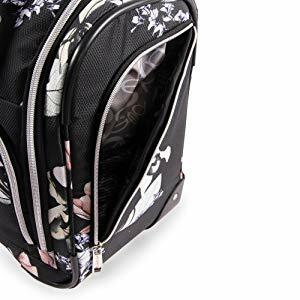 Exterior extra storage comes in the form of left and right zippered pockets and two front facing zippered pockets with the embossed BEBE brand logo. 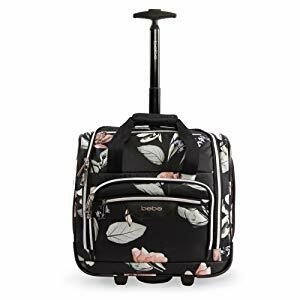 Taking a look deeper into this BEBE luggage review, this company’s standard design materials are being used – meaning polyester printing – but with a unique nylon blend that creates that tough cross-stitch look. What this means is that this BEBE bag offers about as much durability as the Nicole Miller option, although it will be much more abrasion resistant. 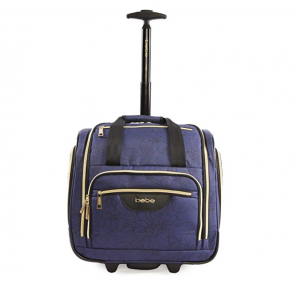 Keeping it brief and right to the point, this BEBE luggage review has taken a hard look at the extras which include a compact tuck-under size, a single poll telescopc handle, and smooth rolling in-line skate wheels. We love what this suitcase has to offer, and it’s obvious that BEBE put all their design efforts into making a one-of-a-kind small carry-on. This suitcase measures in at 16 x 16.5 x 9 inches and should fit under most seats for a national and international flight, but when it doesn’t it will definitely meet the space requirements of any overhead container, even if you’re the last passenger on the plane and space is already limited. Style options include three different unique print choices. By tying a narrow build to long design with rigorous structuring round poly/nylon materials, Samsonite has created a fantastic under-seat bag which meets most airlines and their confined spaces and only takes up a bit of your foot room. Of course, for overhead purposes this suitcase has been tailored to fit into all overhead bins on both national and international airlines. Of the suitcases on this list, this Samsonite bag offers the most storage space; it has an extended roof for more internal space (between 2 – 3 days of outfits, depending on how your pack). Interior added storage comes in the form of two zippered floor pockets which are part of the lining and three zippered roof pockets (also part of the lining). Exterior extras include a deep zippered front pocket and two pockets on the right and left of the bag. 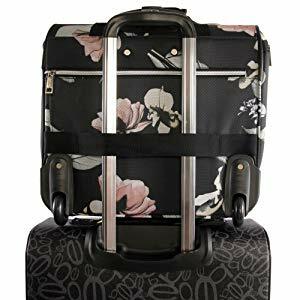 The materials in this design are close in durability with both the Nicole Miller and BEBE Women’s suitcase, offering a blend of polyester and nylon which is abrasion resistant and quite watertight. This suitcase is great for storing your electronics as well, though for more expensive electronics like a laptop computer, you might want to add extra padding from clothes on the inside. Other durability features come in the form of in-line skate wheels made from hardy polyurethane, and a two-pole telescopic handle. 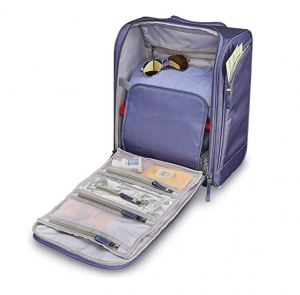 Included inside this suitcase is a zippered compartment which allows you to separately pack damp or soiled items; additionally, there is a removable 3-1-1 pouch and removable hanging organizer pouch. 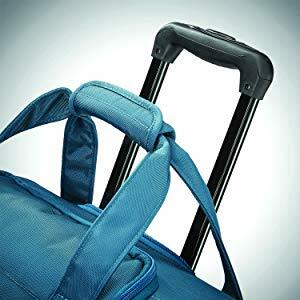 This suitcase offers two haul handles for quick maneuvering around a crowded airport or for better lifting into an overhead bin, as well as a push-button telescopic handle. 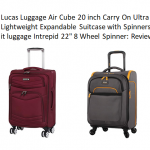 This suitcase measures in at 7.5 x 13 x 16 inches and weighs approximately 5.51 pounds unpacked, it also offers the highest number of style options in this review (up to 4), each of which is uniquely suited to casual travel or business travel. Wherever you go and whatever you’re doing – or whatever your personal style sense requires – there’s a great color to match. When it comes down to the nitty gritty details, the best under-seat traveler in this review is a tie between Nicole Miller’s Quilt Bag and BEBE Women’s bag; both of this match the desired size limits and easy fit properties of an under-seat bag while also offering the maximum storage they can with the added bonus of a medium-high durability. Samsonite’s suitcase on the other hand is a little bit larger than most under-seat options – which is fantastic if you want that added storage space – but most of the time you’ll probably have to pack this bag into the airplanes overhead bin, rather than conveniently under your chair.